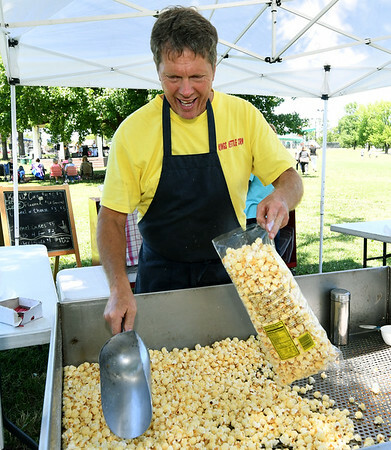 Howard Burnison, of King's Kettle Corn, scoops fresh bags of popcorn for guests at Nan's Band-Aid on Saturday at Schifferdecker Park. Proceeds of the event will go to help the 40 employees who lost their jobs after a fire at the Joplin Workshops laundry. The event was named after the late Nancy Clarkson, longtime employee at the workshop.